Domestic and commercial carpet cleaning services using the latest carpet cleaning technology and equipment. You don’t have to live with dirty or stained carpets and rugs in your home. Our carpet cleaning and stain removal specialists will leave your carpets hygienic, fresh and looking like new. We have extensive knowledge of carpet fibres and removing all types of stains without damage. Unlike others, we pre-vacuum to remove up to 80% more of the dry dirt so the carpet cleaning product we apply gets the maximum penetration. Our cleaners use either steam or low moisture carpet cleaning techniques. We align the right products and practices for the job, to be as environmentally friendly as possible in getting the best job done. Our products are removed from the carpets; any residue products remaining are child and pet safe. We can do anything from freshening up your carpets to more complex dye removal services and sewage remediation. To protect your carpets and keep them clean for as long as possible, we use Microseal, for a lifetime protection against sun, stains and wear and tear. We’re specialists in revitalising even the most delicate rugs. We’ll make sure they dry properly to prevent curling. We offer rug cleaning in the Northern Beaches, Upper and Lower North Shore, Eastern suburbs and the Inner West. We’re also professional office carpet cleaners. Our low moisture deep cleaning service is specifically designed for synthetic and commercial carpet and includes anti-resoiling technology. Our commercial carpet cleaning services (both steam cleaning and low moisture cleaning) are available throughout all of NSW. Call us to arrange a free quote. We’re quick to quote, reliable and we’ll stay in touch on the day so you’ll know exactly when we’re coming. We don’t leave our clients waiting around. Our carpet specialist will come to your home or office to assess the type of carpet fibres and stain. We’ll then talk you about our carpet stain removal process (including hand spotting for those tricky stains like paint, red wine or grease). We’ll give you the best cleaning options for your carpets that are also cost effective. Our team are fully qualified in their areas of specialty and follow our carefully researched systems to get the best results for our clients. The head technician working on each carpet cleaning job has completed vocational training in carpet cleaning through ITI. 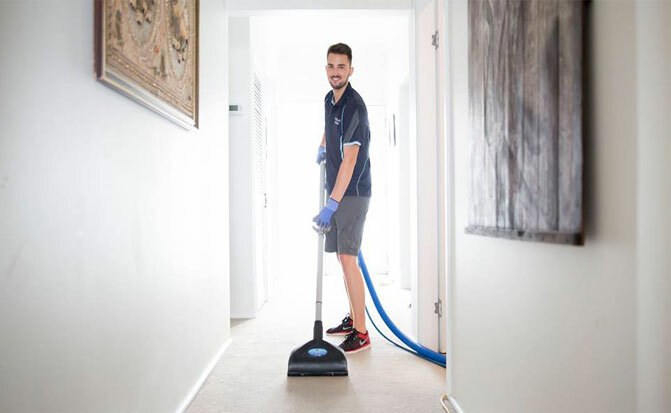 For the best carpet cleaners in the Northern Beaches, Upper and Lower North Shore, Eastern suburbs and the Inner West, contact Pressure and Steam’s Northern Beaches office for a free quote.